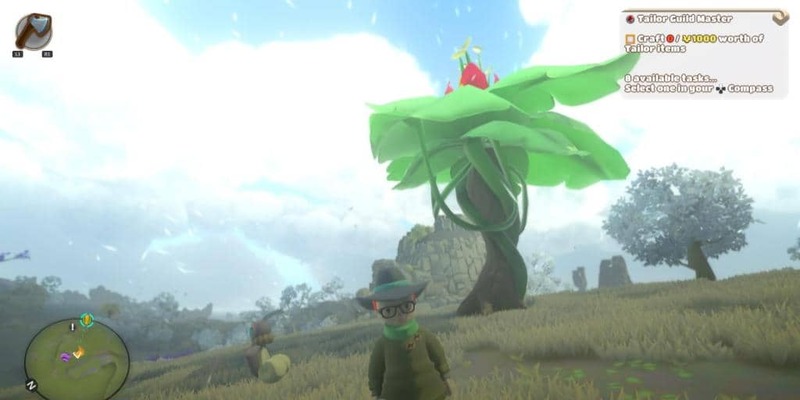 Yonder: The Cloud Catcher Chronicles Review | Nerd Much? A mysterious stone has guided you across the ocean, but a storm seems to have a different idea. The ship is tossed into the sea and you are struck with a vision. A guardian spirit informs you that following the mysterious stone will help you find the answers you seek. You’ll find out about your parents and who you really are. You wake in a shallow cave and your adventure begins. Your mission is to free the sprite children of the guardian and use their combined power to clear the evil Murk. 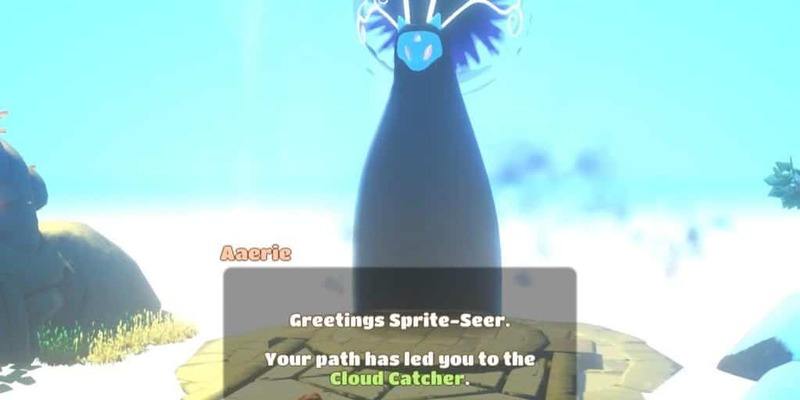 What follows are what in any other game would be grueling side quests; collect this, find this, craft that, and bring it all back to several someones. Build your own farm, but you can’t collect all the animals yet to fill the farm. Nor can you plant your own fields. So onward you push to find more sprites to unlock more areas and more fetch quests. The first area gives you a brief Breath of the Wild moment, where you can see the edges of your world and the many places you can go. It’s an extremely colorful world, and very bright. Sometimes a little too bright, as there are certain towns with street lights that are nearly blinding at night. The villages and people are designed with the word “quaint” in mind. There are no landscapes that inspire awe for any period of time. Some are mildly interesting, like the purple forest I have pictured here, but the splendor wears off quickly. There is nothing substantial to hold you there. 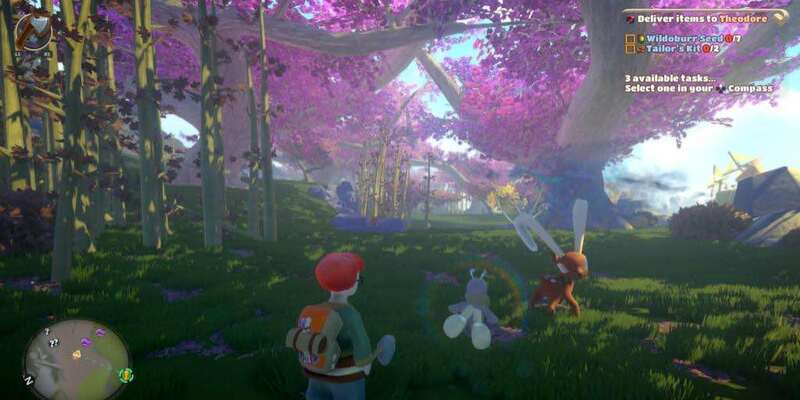 Yonder is beautiful the same way Pingu is a well done clay-mation; you can admire the effort that went into it, but the narrative won’t keep you interested for longer than five minutes. While the landscape is, at least, pretty, the audio and music is as unremarkable as a dollar bill. The general sounds are much like Stardew Valley, pleasant but not entirely memorable. The music is much the same when it makes itself heard. Characters are not voice-acted, though each character makes a noise when you speak to them. I’ll also say that the controls are oddly mapped. For one, the game does not make use of the touchpad at all, which most games do to open the in-game menu. Instead, Yonder uses the triangle button. And the map is completely separate, on the d-pad. I do not know what to make of this. From all of the above, it is difficult to get a grasp on what the developers intended this game to be simply from playing it. Is it a child’s game? Is it a farming simulator? Is it an adventure game? Thereby, I cannot in good faith tell you whether one mechanic worked well or not. I have no basis to compare to. However, Yonder lacks the depth of Stardew. You will have no deep conversations here, no homeless man, no narrative on mental disorders or addiction — none of that. The “evil” Murk is nothing more than a temporary and often pointless obstacle. You can’t truly farm here either; there is no one field in which you plant all that you need, nor is there a helpful timer to tell you when a tree is done growing. You do not water your plants, but you plant them and cut them down. So, there aren’t enough pieces to make a complete farming simulator. So, does Yonder make a good adventure game instead? No. There is no combat. Your tools are purely for collecting materials. You have recipes for food, but you have no health bar. The food is “payment” for farmhands (though I have yet to discover exactly what their function is). The Murk is all that blocks you from particular areas and advancing the plot. However, it is quite literally pointless the rest of the time. Only when you are unlocking a Sprite does it matter. There are pathways around the murk, or you can unlock it, and the area leads to nothing but a chest or an actual dead end. I kid you not, there was one cave I cleared and it had literally nothing in it — not even a treasure chest. In terms of an adventure game, Yonder has taken side quests and sucked all the fun out. If the point of this game is exploration, there is nothing sublime in this nature. Abzû, Journey, Flower, all hold a mystery/a story. Their nature leaves you in stunned awe, whether you care to know the mystery or not. Yonder shows you a beautiful place, and asks you to destroy it in the way of collection. True, you can replant the trees you cut down, but that’s it. There is nothing to keep the player in a given area. It gets boring rather quickly. If Yonder isn’t a farm sim, or an adventure game, is it for children? It is my theory that yes it is. A game for children of ages 5 and up. As long as you don’t eat the controller, you’ll be fine. It is the only category that can put Yonder in any sort of positive light. When I was about 6 or 7, this game would have been perfect. It was around then that I would pick up Ocarina of Time and did everything but combat. I made up my own stories about certain areas and directed Link on my made-up missions. Yonder would have filled this need exactly. I was old enough to understand game mechanics, but too shy to try my hand at “skilled” combat. Yonder can give a sense of accomplishment without any in-game danger of risk. There are hours and hours of collection to be had here. Go fishing, cut down trees, mow the grass – whatever you like. You might even stumble onto the plot. As a child’s game, I would rate Yonder slightly higher, but even children deserve more depth in story than Yonder can offer. As an adult, however, Yonder doesn’t know what it wants to be it falls short in all possible categories. There’s not enough farming for it to be a farming simulator, not enough danger to be an adventure game, and not enough story risks for a children’s game.